Just add water to a sprinkle of Insta-Snow® for an amazing reaction that erupts before your eyes. You’ll create “snow” so realistic that you will fool and amaze your family, friends, and any movie camera. Note: Packaging changes from time to time. Explore the science of superabsorbent polymers with an amazing, non-toxic powder that erupts into an amazingly realistic drift of “snow” when you add water. Packed into a small amount of the dry powder is an amazing reaction. Insta-Snow® is a compact, superabsorbent polymer that quickly (in seconds) “drinks” up lots of water and "erupts" instantly, expanding to 100 times its original size. The reaction is very fast and very visual. Kids and adults of all ages will love it. 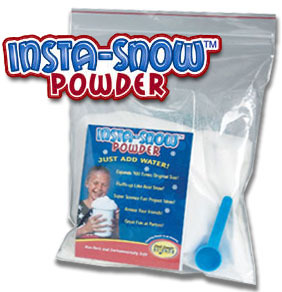 The Big Bag of Insta-Snow ® contains one pound (454 grams) of snow powder and makes approximately eight gallons of faux snow. Ages 4 and up.